The primary reference for pistols made by Fabrique Nationale (FN) is Anthony Vanderlinden’s excellent book FN Browning Pistols: Side-Arms that Shaped World History. In the book he covers the complete production history of each pistol, including all the various contracts and use-markings. Vanderlinden also provides an excellent summary of information about the Model 1903 in an article on the American Rifleman website entitled “The FN Browning Model 1903.” I refer the reader to his article, as I will only cover his topics briefly here. 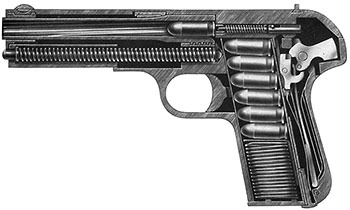 John Moses Browning’s first pistol design for FN, the Model 1899, was an instant commercial success. 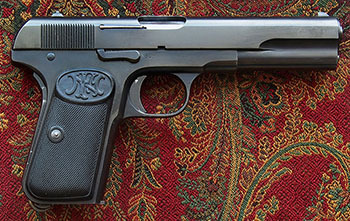 The Browning pistol was chosen by Belgium to be its standard military side-arm, but the Belgian military requested a number of minor changes to the original design. The re-designed gun became known as the Model 1900, and manufacture of the original Model 1899 was curtailed within a few years. FN tried to obtain other military contracts for the Model 1900, but the general preference was for a pistol with a longer barrel chambered for a more powerful cartridge, so FN asked Browning to design such a gun, possibly as early as 1900. Browning made two prototypes of this design in 1901: a large gun chambered in a 9x20mm caliber and a much smaller gun chambered in 7.65mm (.32 caliber). Both these prototypes still exist in the Browning Museum in Ogden, Utah. 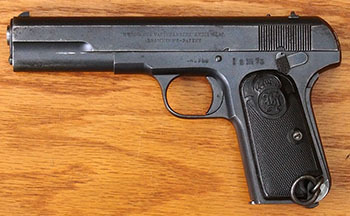 The large gun was intended to be Fabrique Nationale’s military pistol, and has a lever on the right side that locks the slide open when the magazine is empty, while the small gun was intended for the Colt’s Patent Firearms Manufacturing Company which had asked Browning to design a pocket gun. The patent itself is based on the smaller prototype and does not show the lever to hold the slide open. Browning filed his patent on 3 April 1902, and U.S. patent number 747,585 was granted on 22 December 1903, hence the model designation of 1903. Within FN the gun was referred to as the Browning Grand Modèle or the Browning Modèle de Guerre. Only later, when additional Browning designs were manufactured, was the gun given the Model 1903 designation. The design became a classic. It is simple, reliable, accurate, and safe, and is probably the most copied handgun design in the world. Its simplicity derives from its unlocked-breech design and minimal number of parts; its safe operation from the manual safety lever which locks both the sear and the slide, the grip safety lever which also locks the sear and prevents firing unless the gun is gripped firmly in the hand of the shooter, and the disconnector which prevents the trigger from bearing on the sear when the slide is out of battery. Recoil is retarded by a spring beneath the barrel and a heavy, fully-enclosed slide. Flat springs in the rear of the grip tension the hammer, sear, and grip safety. Five lugs on the underside of the barrel mate with five slots on the top of the frame. The barrel is stabilized at the front by a bushing with bayonette lugs which is held in place by a small locking rod at the front of the recoil spring. The trigger connects to the sear via Browning’s patented stirrup-shaped connector bar which runs on either side of the magazine to provide a smooth, even trigger pull. The disconnector is in the very center of the gun, just behind the magazine, and operates by pressing down on the rear of the connector bar when the slide is out of battery, disconnecting it from the sear. An external lever on the right side of the gun is pushed upward by the magazine follower when the magazine is empty, locking the slide open. This lever is tensioned to remain in the down position by the recoil spring. Interestingly, Browning’s prototype has a forward extension on this lever which allows it to be manually released. On the production gun, however, the extension is omitted and the lever is only released by either removing the empty magazine and drawing the slide back or by inserting a full magazine and drawing the slide back. 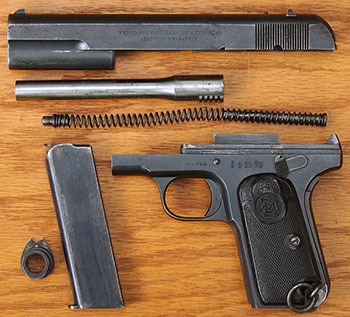 The parts list for the M1903 consists of only 27 items. The front sight is a half-moon shape, staked to the front of the side, while the rear sight is dovetailed and drift-adjustable. The front sight was later modified by cutting it in half vertically to provide greater visibility. This was originally done to the Husqvarna production pistols (see below) but many Belgian guns are also found with this modification. One variant of the Model 1903 has the base of the grip frame slotted to take a shoulder stock, which is held in place by an extended ten-round magazine. The serial number is on the right side of the frame just in front of the slide lock. The serial number is also stamped, in part or in full, inside the slide and on the barrel, barrel bushing, hammer, trigger, magazine, and grip plates. The grip plates are of checkered horn with the FN monogram in an oval cartouche at the top. A lanyard with ring is staked to the base of the grip frame on the left side of the gun. Full production of the gun didn’t actually begin until 1908 and ended in 1928 with, according to Vanderlinden, a total of 58,442 produced. John Malloy believes that John M. Browning derived his cartridge designs from existing revolver cartridges. In the case of the .38 Auto, Browning started with the .38 Colt Long cartridge, then shortened the case and reduced the rim diameter until he had a cartridge that would feed and eject properly in his prototype gun. Only then did he take the cartridge to Winchester or UMC for manufacture. Since Browning had already developed the .38 Auto cartridge, when FN asked him to design a military pistol it is almost certain that he simply reduced the weight of the bullet and the length of the case of his existing cartridge to make the 9mm Browning. To the best of our knowledge the cartridge was first produced in Belgium. It is much less powerful than the 9mm Parabellum or the 7.63mm Mauser. Note: For this chart I used bullet weights and muzzle velocities for standard military cartridges taken from Cartridges of the World or White & Munhall. Bullet weight and powder charge may vary between manufacturers. Ezell asserts that “...many armies rejected this pistol outright because it was a blow-back weapon...” and Kinard repeats this sentiment, but it appears to be based on reasonable assumption in retrospect rather than actual facts. Vanderlinden says: “There has been a good deal of speculation as to why the Model 1903 did not achieve higher sales figures. Most often it has been incorrectly attributed to the blowback design or the non-standardized cartridge, but none of the trials reports make negative mention of the blowback design.” More likely the gun’s less-than-stellar success was based partly on bad production timing but largely on the desire of many armies for a more powerful cartridge or a larger caliber bullet. Bergmann achieved some success with his 9mm cartridge, as did Steyr with its 9mm, but the 9mm Parabellum became the standard military cartridge for Germany and eventually became the most widely used cartridge in the world. R. K. Wilson writes of the 1903 Browning: “The pistol is very well made.... It is reasonably reliable in its action and shoots satisfactorily. 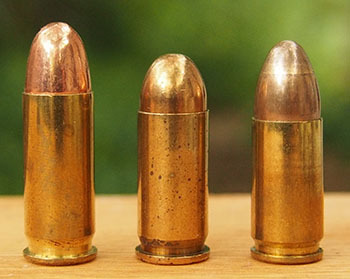 It is otherwise unremarkable.” Of the 9mm Browning cartridge, he says: “It is not distinguished for its ballistic efficiency and has relatively little stopping power, being inferior to other 9 mm. cartridges in this respect.” That pretty well sums it up. Draw the slide back and lock it open with the manual safety lever. Turn the barrel 90 degrees counterclockwise (as you face the gun). Release the safety lever and carefully draw the slide and barrel off the frame. Turn the barrel bushing 180 degrees to unlock and remove. Rotate the barrel back into its home position and remove it from the front of the slide. Barnes, Frank C. Cartridges of the World, 10th Edition, Revised & Expanded. Krause Publications, Iola, WI: 2003. Janson, O. Browning pistol M1903 becomes Swedish Pistol m/1907. Malloy, John. “Early Auto Pistol Cartridges.” Gun Digest, 1995. Olson, John. Famous Automatic Pistols and Revolvers. Jolex Inc., no date. Vanderlinden, Anthony. FN Browning Pistols: Side-Arms that Shaped World History, Expanded Second Edition. Wet Dog Publications, Greensboro, North Carolina: 2013. Vanderlinden, Anthony. 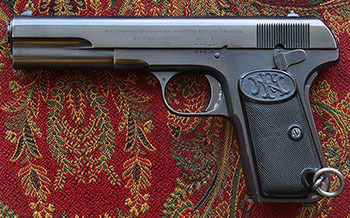 The FN Browning Model 1903. White, H.P. ; Munhall, B.D. ; Bearse, Ray. Centerfire Pistol and Revolver Cartridges, New and Revised Edition. A.S. Barnes & Co., New York: 1967.